Are you happy with your financial options right now? Eric Roberge wants to let you know you have more control over your personal finances than you might think. He’s the founder of Beyond Your Hammock, a financial planning firm that caters to the needs of professionals in their 30s and 40s. Let’s just say as you can tell from the name of the firm, this isn’t your parent’s financial planner! He told me he never thought he would work for himself, but the corporate world wore him down. He was a portfolio accountant at State Street Bank and n assistant treasurer at JP Morgan Chase. He came to realize that self-employment offered him greater financial security over the long term. When starting a new business it’s better to share your passion, instead of selling your products or services. 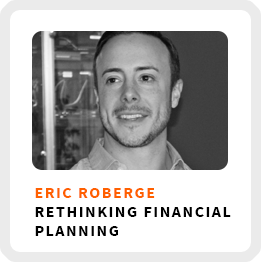 Why Eric decided to take a job as a waiter at the age of 33 and after doing pretty well in the financial industry as a stepping stone to working for himself. Why he decided to choose an untraditional name for his firm to elicit questions from potential clients rather than preconceived notions. I have some big news to share with you now about the Life Skills That Matter podcast . . . . this is the final episode of what I’m calling season 1 of this podcast! I shared a podcast every day focused exclusively on collecting stories about people who made the transition from employment to self-employment to inspire you to do the same. In our next episode, we’ll begin season two where I’ll still be sharing stories about people who made the transition to self-employment, but I’ll be doing more episodes focused exclusively on lessons about life and skills to help you make your own transition. I’ll also only be releasing two episodes a week to give you all a chance to catch up on all the shows I’ve been pumping out! Practicing self-awareness to understand your core motivations. Aligning spending habits with a financial goal. Core work activities + habits: 1) Blocking time for the most important tasks. 2) Networking to meet new people and have new conversations. 3) Have a general understanding of where he’s going. Ideal work environment: Saturday morning, listening to music from Focus at Will in a space where he can write on the walls to visualize his ideas. Superpower: Ability to listen to someone and understand their feelings to adapt advice for them. Self-reflection practice: Listening to music or walking on a beach and being in his own head. Book recommendation: The Obstacle Is the Way by Ryan Holiday. 90-day goal: Get more speaking opportunities and increase audience sizes, targeting 1000+ person audience. Common spending problems: Restaurants and spending money in areas they don’t value since they don’t have a plan or goals. 1) Understand your income needs. Figure out both how much you need for your expenses, as well as what you need to meet your savings goals for the future. 2) Look at other businesses in your space. Examining how others are doing in your field can give you an idea for what your income possibilities are.